Last August, we crowned Alexi Bladel as our 2018 Miss Winnebago County Fair Queen. Alexi competed in January for the State competition in Springfield. On Sunday, January 20, 2019, Alexi made history! 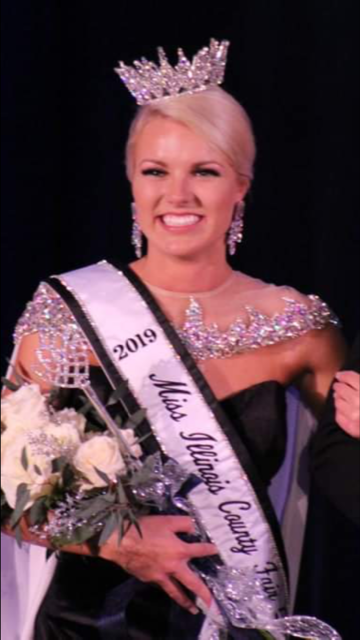 As the first Winnebago County Fair Queen to be crowned The 2019 Miss Illinois County Fair Queen. On February 23, 2019, Alexi was proud to crown 1st Runner-Up, Paige Gors as the new 2018 Miss Winnebago County Fair Queen. We are blessed to not only have just one but two wonderful young women to represent our county fair and our state. Welcome to the 2019 Miss Winnebago County Fair Queen Pageant! The 2019 Queen will win a $1,000 scholarship, her entry fee paid to the State pageant in January 2020, and many other prizes! The 2019 Junior Miss Queen will win a $500 scholarship! The 2019 Little Miss Queen will win $200.